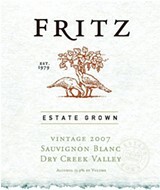 Whenever I've glanced at Fritz's wine label over the past few years, I always think of dinosaurs. Upon closer inspection, the label does not depict cretaceous-era creatures, hanging out under some ancient tree, but perhaps this error is a fanciful masking of what it really depicts, something more terrifying to a grape grower than terrible lizards: a flock of wild turkeys, decimating a poor old Zinfandel vine. When I asked our guy at Fritz about the label, he said, well, we have a lot of wild turkeys up here, and you know . . . Could be a kind of totem? The last time I visited Fritz Underground Winery, it was just Fritz. The winery was still underground, to be sure, as evidenced by the historical photos of the building process (which can be hair-dated to approximately the late 1970s-early '80s era) behind the tasting room bar. But it was just as warm, from the cozy wood stove in the corner on a winter's day as it was on this hot, end-of-summer afternoon. The tasting room is a little less than underground. But that made the first offering a welcome refreshment to take out to a patio table, overlooking the quiet hill country north of Dry Creek Valley. The 2008 Russian River Valley Sauvignon Blanc ($18) is one of the leanest SBs this side of Sancerre, with racy acidity and grapefruit-lime flavors and notes of white fruit, underripe pear. Quite to the contrary, the very ripe 2006 Estate Zinfandel's ($25) brambly flavors were accented with ethyl acetate and hot, woody tannin; but on account of the oppressive heat of the day, I wouldn't write it off for a winter's tasting. The 2006 Dry Creek Cabernet Sauvignon ($35) was simply a nice, light-bodied and balanced claret. The Fritz family has also taken on responsibilities for Lost Canyon Winery, formerly of Oakland. None of Lost Canyon's well-liked, plush Syrahs were on hand, but the 2006 RRV Pinot Noir, Widdoes Vineyard ($42) was notable for its high note of spicy, cinnamic acid. The 2007 Late Harvest Zinfandel ($25) was predictably delicious, as per the style. Sweet, dark fruit with an emphasis on pure grape flavor, this is the after-dinner nectar that nature affords us at the end of the harvest, made from those grapes that escaped the gizzards of the turkey hordes. 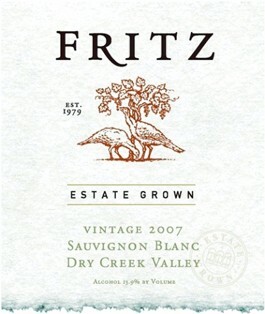 Fritz Underground Winery, 24691 Dutcher Creek Road, Cloverdale. Open daily, 10:30am to 4:30pm. $5 fee. 707.894.3389.